Maximum diameter of produce that can be used 4.5" 5" 7" 6"
Diameter of Vegetable Holder 3.5" 2" 2.5" 2"
Comments This is our best selling Spiral Slicer due to the price. It allows you to create angel-hair style "pasta" out of many vegetables. This is a fine, delicate style tool from Japan. Its quality is high, and it works well. It allows the most flexibility with 4 different style cuts. This is the original 3-in-1 vegetable slicer. Many people prefer the horizonal cutting path of this unit. We prefer the vertical cutting units. This is fine, delicate style tool from Japan. Its quality is high, but the size is smaller than than the other two units. It allows the most flexibility with 4 different style cuts. What types of produce can be used in the Spiral Slicers? Only hard vegetables can be used. We have had success with: Onion, Zucchini, Carrot, Beets, English Cucumber, Turnip, Potato, Sweet Potato, Daikon Radish, Butternut Squash. Do these slicers really make "noodles" out of vegetables?? More technically, these slicers make long, really long (up to 6 feet or longer!) julienne shreds out of certain kinds of vegetables. People that eat a living / raw foods diet, like to call these "noodles" or "pasta" since they are simply fancy, shredded vegetables. Raw Foodists would consider these a no-cook replacement for normal pasta, which would be cooked. Which Spiral Slicer do you prefer? It depends on the recipe we are preparing. If we are making something that requires a small "Angel Hair" or "Asian-Style" Noodle, we prefer the spiral slicer (Saladacco) because it makes a smaller sized noodle. The Spirool allows two different style noodles to be created, a "thicker", "heartier" noodle on the largest size and a medium sized noodle. 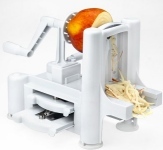 The Vertical Spiral Slicer and Tsumapuro has the most flexibility due to being able to create Angel Hair, Spaghetti and Linguine sized pasta as well as ribbon style cuts. What are the different size "noodles" these Slicers make? Thin Linguine Pasta - 4mm wide strips made by the Vertical Spiral Slicer. Which Spiral Slicer is faster to use? The 3-in-1 turning vegetable slicer is easier/faster to use, and will allow to process the produce faster than the Spiral Slicer (Saladacco) because you can put larger pieces of produce into the slicer at one time. Having problems using your spiral slicer? Please read our article on how to properly use the spiral slicer. We find many of our customers do not properly use the spiral slicer correctly, and get poor results. We have written this article to help prevent this from happening. We originally wrote this article to help our customers use their Spiral Slicer, but the same concepts will also work with the Spiralo Spiral Slicer. Shipping depends on the weight of the spiral slicer and your zip code. To get an estimate, proceed to the web page of the item and enter your zip code in the space provided and click "go".